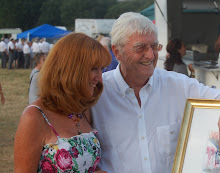 Odiham Exhibition and Book Signing : Tomorrow! Tonight I will be delivering books to THE FRAME gallery in Odiham, Hampshire in preparation for my book signing and " Meet the Artist" event there which takes place tomorrow evening. The preview starts at 5.30 p.m and everyone is welcome. There are a few paintings from my book available on sale for the first time along with some new favourites. This to me is a\ celebration in many ways and not just about my turning into an author for the first time. I have had an amazing year but "The Frame" is a new gallery and has sold many of my paintings in the short time it has been open. As a gallery owner Jan boasts a wide range of styles from many artists so a visit when in the area is highly recommended. As one of the exhibiting artists I can freely admit it is a pleasure knowing her which is why I know tomorrow evening is going to be wonderful. During my workshops I often share my thoughts and one topic has cropped up which drew me to share my views. I am aksed many times how I stay so happy all the time. It is simple. Surround yourself with positive energy always and you then cannot fail. I admit I love being surrounded by cheerful people and friends as my own mood is often light,positive and bubbly. We all have times when we can't be as happy as we would like to be but then painting can lift our spirits. We are so lucky as artists to be able to "escape" into a world that is so carefree simply at the touch of a brush. But what if that brushwork leads you to hearing comments you would prefer not to hear? Well firstly look at the source of who is running your work down. Ask yourself why are they being so negative? Can they paint? If so do they paint in a style you wish to paint in? Then look at the comment for what it is. Just one persons opinion and it may not even be a true one. The secret to a happy life is to believe in yourself whatever you are doing. Your opinion counts. For many that is hard to accept. But no one is either better or worse than you. You are your own master unless you choose not to be. 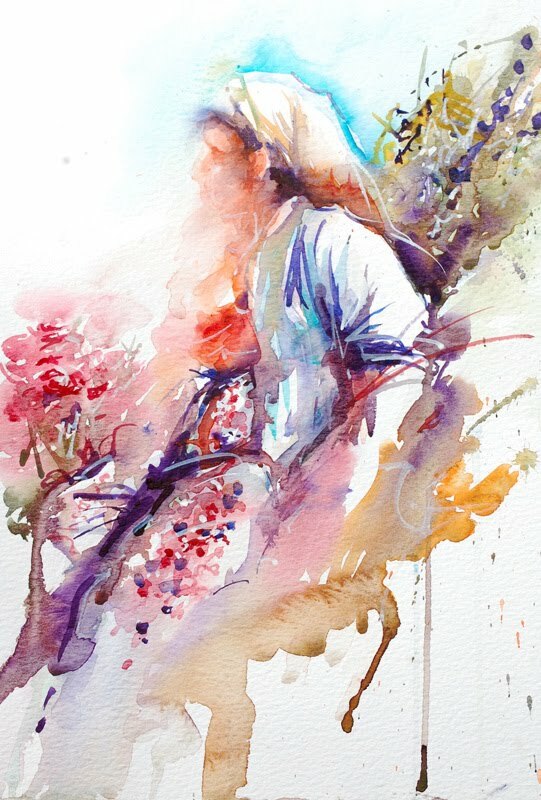 Like watercolour you are free to be spontaneous. So if someone is negative in your life maybe you need to pull a wall around you and think like the cat in my painting above. What you think matters..........who you are matters.......and as for negative comments? I am winking here, and smiling. P.S. I care very much. About people and things worth caring about and spending energy on! I recieved the recent issue of the SAA,Society for All Artists Paint magazine today and was delighted to see my feature on how to paint cats in a loose style included. Considering I recently wrote a series on how to paint dogs in a loose style it seems very fair to allow cats a little time in the spotlight too! I hope SAA members and friends enjoy the article. I also recieved the SAA,Society for All Artists catalogue and found my book and DVD advertised on the very first page of the inside cover.This really is one of those moments you just wish a friend had been there to see your face. For as long as I can remember I have looked at art catalogues but never for a moment imagined my name would be one of the authors included. Dreamed about it yes, on many occasions but never saw it actually happening. This followed the day when I held a workshop in UK with my book in my hands for the very first time facing an art group here. Everyone who has been to my sessions will know I often share my favourite inspirational books by other authors. Those who have motivated me in my own journey. To hold something I have written seemed very unreal! Thank you to the team at SAA for making dreams come true! On todays workshop I took time out as always to work with members of the group individually on their chosen subjects flitting from one to the other as time allowed. Looking back I painted a deer, a sheep, a cat and when I looked around at one point a hand waved at me from the back of the room. A photograph I had taken into the session of roses had caught the attention of one of the artists and they wanted help with ideas on how to create the essence of them in watercolour. It's quite amazing but I had a tutorial online about painting roses from years ago which I still recieve comments about. 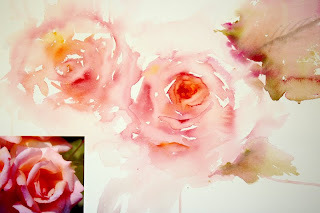 My style has changed over the years but I still seem to paint roses in this particular way. Dropping Alizarin Crimson onto wet paper or working from the centre point bleeding colour away in almost radial patterns. I "see" petals form in the patterns created purely by pigment and water and these turn into the rose eventually. Foliage along the edges creates the outer shape of each bloom and this colour allowed to run into a few outer petals adds extra interest. My roses are now recognisable it seems from the lovely comments I recieve. My way of painting them isn't so much that I try to paint the flower. I aim to paint the impression of their sweet heady perfume on a summers day. Hence my titles usually include the word " Scent ". I have painted " Scents of Summer"," Summer Scent" and many more that lead the imagination to taking in more than simply viewing a painting of a rose. In Norway we almost had a rose garden during one workshop so it seemed fitting that in England we had roses in todays session too. Thank you so much for the lovely emails asking me to please share more roses. This summer I have been so busy but I hope to share a few more here very soon! I must be one of the luckiest people on earth. Not only do I get to paint on a daily basis but via holding workshops I get to share my passion for watercolour with the most wonderful people. Today saw the first of my weeks workshops in Hampshire, U.K. The group consisted of artists new to my sessions and a few who had been to my workshops before. We started the day with simple warm up exercises and yes, to everyone who knows me that "tomato game" came up again only with a twist this time! And everyone fell in love with their tomatoes. I realise this only makes sense if you have ever been on one of my workshops sorry! Following the morning warm up exercises we looked at colour and water.Literally watching paint dry which is pretty fantastic when you work in this medium. I created three effects, one for fur, one for ripples in a poppy petal as seen in the image above and one for feathers using directional brushwork. Following short demonstrations it was time for lunch and before we knew it the time had come for the session to close. Time passes far too quickly when a day is so enjoyable. I look back at a room filled with eager enthusiasm and so much talent. Each time I teach I learn this. I learn that many people are unaware of how truly gifted they actually are. Because today I saw genuine beginnings of many future paintings that could be filled with excitement,drama and impact. All in individual unique ways. 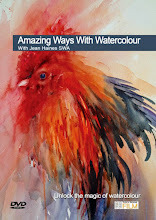 I am privileged to be a part of watercolour journeys by others and that thought does thrill me. I want everyone I know to love watercolour as much as I do. 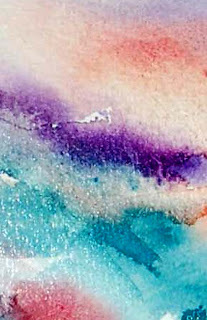 I want everyone to get as excited as I do when gorgeous colour fusions occur in front of their eyes and I want everyone to feel that blissful feeling of magic when things go right in a painting. As I feel when I capture the essence of many subjects simply and with emotion in my paintings. Tomorrow sees a different group of artists and demonstrations. 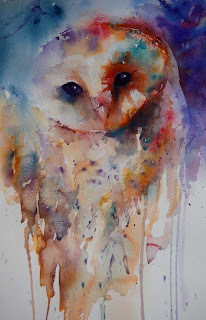 I didn't realise until I shared this painting on my blog how appropriate the title was. Anyone who has been on my workshops will understand what I mean when I say how quiet everyone is when I demonstrate. I often have to look behind me to make sure everyone is still awake. I've been told that everyone is so fascinated by the images appearing on paper from my brushstrokes that no one wants to talk. But as the demonstrating artists sometimes you just have to make sure everyone is actually still there! The room is often so quiet you could hear a pin drop. And it is rather magical when this happens because then I know I have taken everyone to where I am in my mind with my painting. I am at one with the subject and what is flowing from my imagination which is intriguing us all in the same way. Even though I have painted in this style for years I still can't get used to how images appear as if by magic after a few brushstrokes. Placement of colour, placement of detail in the final layers on top of the base colour can lead to incredible and unique results. With no preliminary sketch I can be certain I cannot re create exactly the same painting ever again which to me is also magical.
" Quietly Watching" will be at " THE FRAME" Gallery in Odiham next week for my book signing and exhibition. 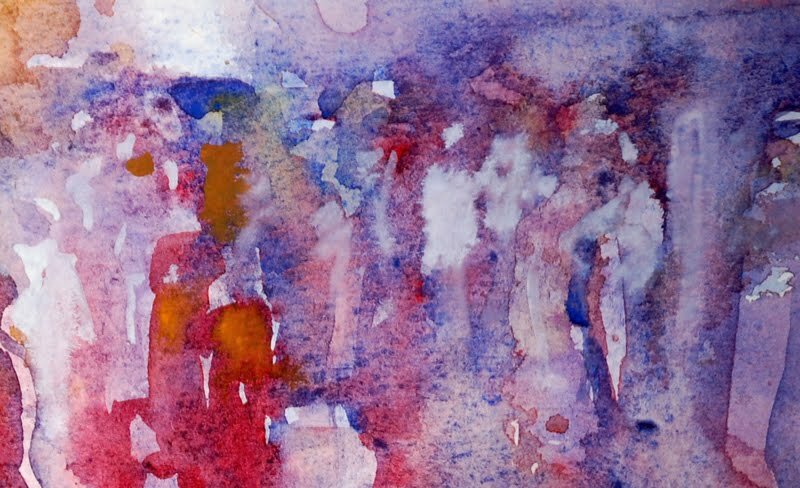 Section from a larger painting in watercolour. Another week has passed and I am taking time out this Sunday to think about how lucky I am. A week ago I had just left Norway after my workshops there with incredible artists and now I am facing a new week ahead with my upcoming watercolour workshops in UK. I have read emails from excited artists attending who have been looking forward to these sessions. Each time I read such comments I feel so encouraged to share my passion for this magical medium even more. There is no other medium that can throw surprises at you consistently with its incredible unique effects from colours merging. 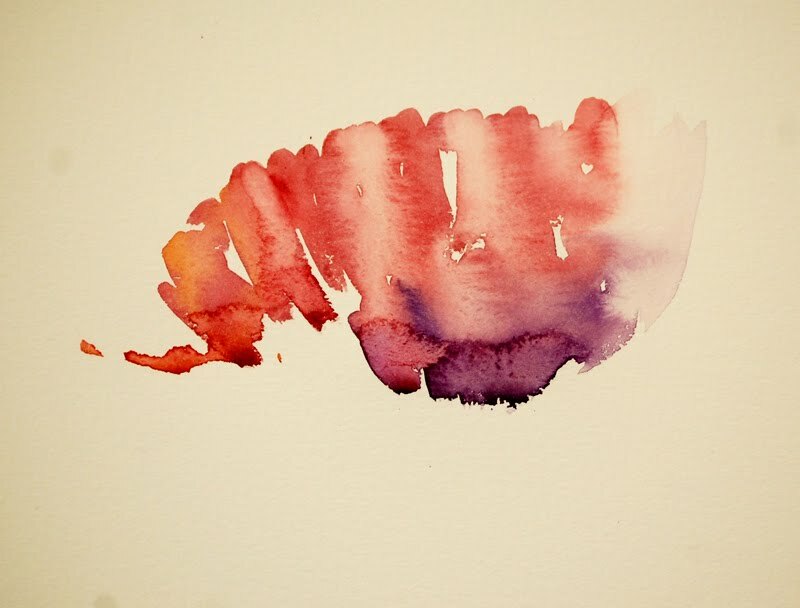 When pigments first meet and hit water on paper its reactions can be so fantastic. Allowing them to do what they do best without our interference while they dry can lead to such amazing results. And yet so many artists race to complete a painting. I often find the journey to completion can be far more enjoyable than the actual finish line! Patience is a virtue so they say but how many of us have careers where simply sitting and watching paint dry is such fun. Indeed, I AM very lucky! 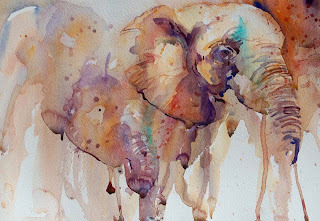 Next week I have watercolour workshops in Hampshire ,U.K. Many artists will be attending over the week long period on seperate days and sessions. The popular "Watercolours With Life" workshop starts on Tuesday and Wednesday followed by "Autumn Glory" on Thursday which is a special workshop to celebrate the colours of Autumn. I take so much to these workshops so setting up the venue in advance is always a favourite part of these events. Music for different moods and colour choices are what I listen to quietly in my studio leading up to the new sessions. 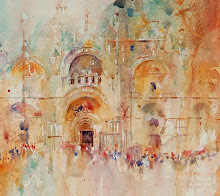 Then the gorgeous treasure hunts begin while I constantly search for new and surprising subjects to paint. I aim to make each workshop as fantastic as possible to not only inspire during the classes but also motivate everyone who leaves to feel they can't wait to pick up their brushes as soon and as often as possible when they get home. I understand that a workshop is not about the demonstrator as much as what the artists attending get out of it. 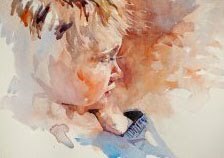 How they enjoy the experience and how they can use the techniques in their own style when they return to their own way of painting alone. Next week is going to be so much fun and I really can't wait to get started. I also have a book signing on Thursday evening in Odiham so please come if you are near the area as I would love to see you there. 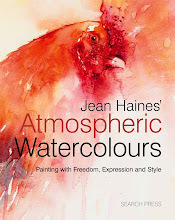 The Frame Gallery, Odiham, Hampshire, U.K.
2011 Watercolour Workshops will be added to my web site at the end of September.These will take place in Hamsphire, UK in February, April and May. Places will be strictly limited for maximum enjoyment from all who attend. More details of each will be added soon. The February 2011 workshop will be a three day course starting with exercises in working loose leading to complete paintings. Intense but great fun! This is a special course that has been requested many times. I will take bookings on a first come first served basis. In the past I have recieved so many comments from artists who have been so disappointed because they cannot get on my sessions due to their popularity. So please book early once the dates have been posted on my web site to ensure you get a place if you are interested. Due to exhibitions and writing my time next year for workshops is really limited so it really will be wise to book as soon as you can to ensure you can get in. Courtesy of Helen for the image to work from. Yesterday two wonderful friends came to visit me for the day which started with a casual lunch followed by a private preview of my DVD. This was an unexpected part of the day as I hadn't thought about whether to share it or not before they came. But I mentioned I had a rough edit and was encouraged to show it. So following lunch three friends sat watching a TV screen as my demonstrations and exercises were watched for the first time by others. I was reminded of when the cover of my book was first launched. I was nervous then but here I am on view as well as my techniques. It is a very different experience to writing. The day the DVD was filmed I was given an amount of time to screen each demonstration. When filiming you have no audience watching to react to what you are creating. It is just you and a camera. Actually many cameras zooming in from all directions! The studio was very hot and the lighting was not what I am used to. On top of this I needed to work flat for the camera to easily see what I was painting. I usually work at an angle.So in a way I felt all odds were against me to create something really fantastic. Whilst my friends watched the screen I very nervously watched their faces looking for hints of a reaction. They seemed so serious and quiet and then it hit me that they were enjoying the sections and taking in what I was describing. I felt very emotional as I studied their expressions. They liked it! My fears were unfounded and their feedback has been really helpful to me. I will STILL be nervous when my DVD becomes available and will probably want to hide for a few months! I can't describe why but as much as I teach constantly being on screen is not something I had ever considered before now. It was such an unusual feeling to be on TV with friends in the room who have seen me painting on many occasions in reality and yet they still seemed fascinated. They are however very wonderful friends and very special to me. I am so lucky to know such an amazing number of people from all over the world with genuine hearts of gold who encourage,inspire and offer support in so many ways. Which is why I always want to give as much as I can in gratitude for all that is given to me. 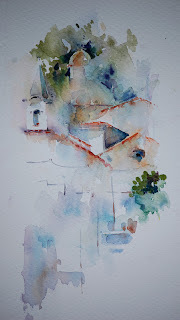 Following the DVD watching we all painted and as Helen had just returned from Portugal I did a small quick study from one of her photographs aiming to capture sunlight and a feeling of the beautiful little white buildings there. Which certainly made the room feel brighter as it was pouring with rain outside! A memorable day and yet many of mine always seem to be that way lately! Thank you so much Lindsay and Helen for a terrific day and evening yesterday! Details of the DVD release will be available soon . Appearing from a first wash in week one from my trip to Norway to hold watercolour workshops there. When I arrived in Norway I had time to tour Bergen for a few hours and saw so much that is really beautiful and needs time to share in another blog entry. But I also came across an image of Grieg the composer. I was immediately drawn to his face which to me said so much about him. We both create.We both hold the deepest passion for what we feel in our hearts which needs to be translated for others to enjoy. 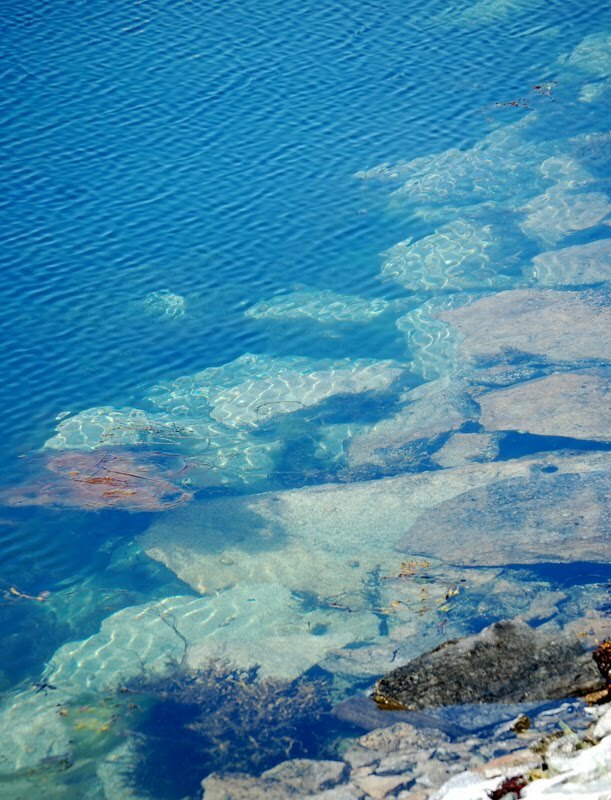 I felt strongly connected and carried this small image around with me for the whole of my stay in Norway. I constantly looked at the stunning and beautiful scenery and could well imagine how it must have felt to work in such a setting. The first weeks workshops flew by so quickly and covered many subjects.Because my style lends itself to painting anything at all everyone in each session could choose what they wanted to paint rather than be given a set subject.They were free to express themselves as each day I gave further demonstrations as to how I would start a certain subject or choose colour and brushstrokes. By the end of week one I was dreading the moment when I would have to say goodbye to such wonderful people. I had enjoyed their company so much I truly wanted to give as much as I could before they left. The final day of my workshops is one where artists usually paint freely and I advise on what they have learned during the week. But this time I spent the morning demonstrating to an enthusiastic audience. Demonstrating many subjects! 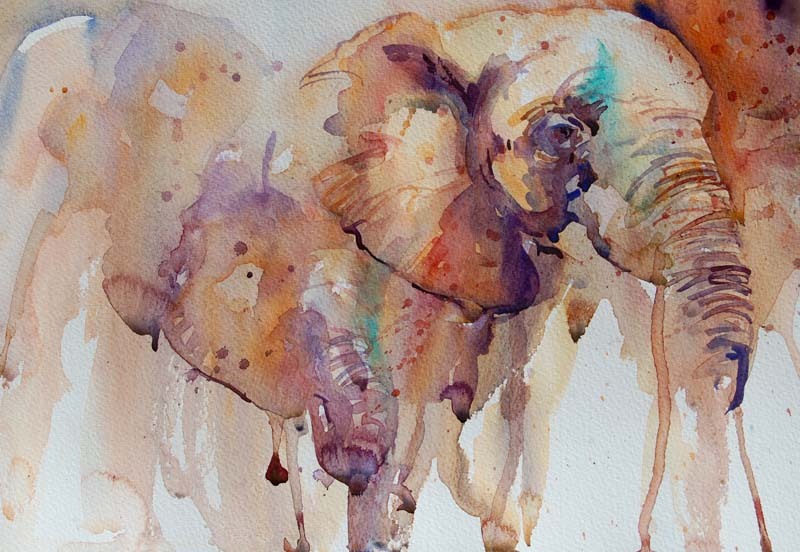 We had three paintings of elephants on the go at one part of the morning and completed. Even a troll appeared ! This was totally out of the blue but one of the class members created the most amazing trolls I just had to paint one as I never had before which had us all laughing at times. I asked if anyone would like to see me paint a portrait and Grieg was my model. 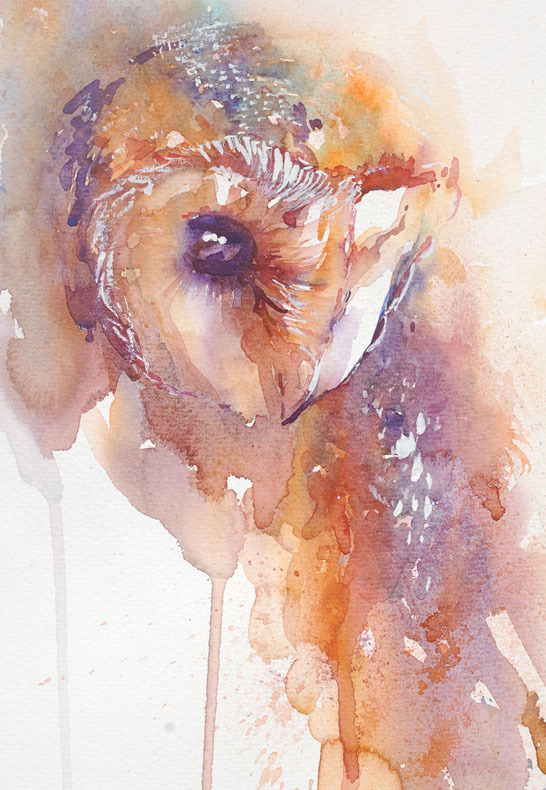 I painted him in very delicate monotone colours at first gently finding his features. At first his chin was not accurate but I have altered that section to make it as small as it really was. I was told he had big hair and was a tiny man. Small he may have been in appearance but the magic he created worldwide was tremendous. I adored painting him as I love working with portraits. I always have. He brought my workshops to a close that to me will always be remembered. A magical time with magical people. To this very special friend if you are reading my blog I am still so very happy and over the moon everything is alright. 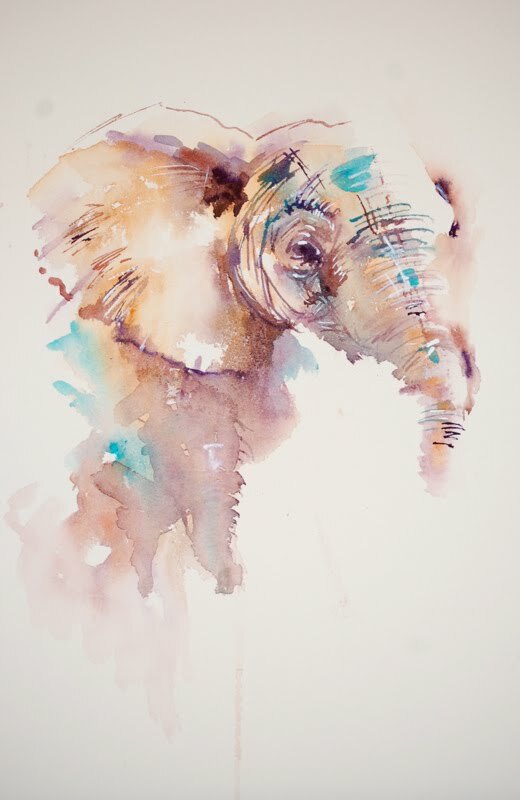 Now keep that elephant and use it to direct you to keep your brushes moving! Huge hugs from me to you! The day I watched this herb picker gather tea from the mountains in Turkey I had no idea I would be writing a book. I had no idea that she would feature in it and I had no idea how much she would come to mean to me over the next twelve months. 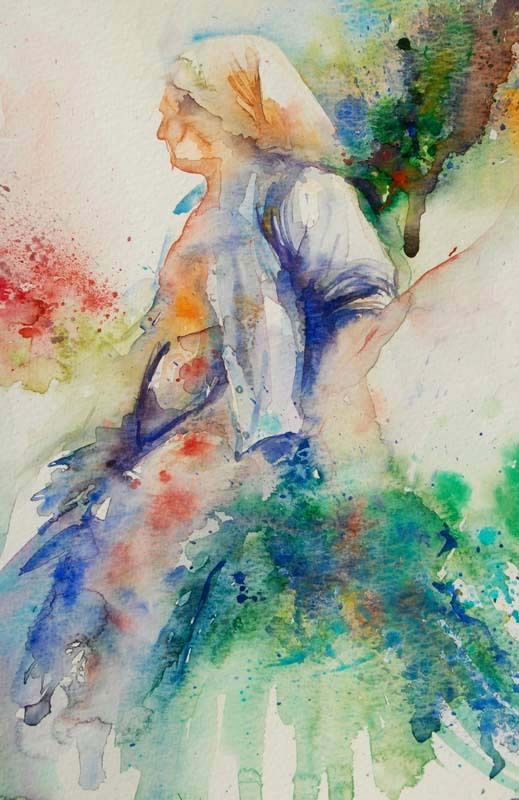 At the time all I could take in was the glorious sunlight playing on her clothes and seemingly making parts of her completely disappear.This is how I saw her through my artists eyes. Half hidden in strong sunlight, a collection of directional brushstrokes, lines and patterns.To this day she still appeals to my brush and she gets more vibrant with each new time I attempt to capture that moment on paper. She is of course in my book and this new latest painting will be at the " The Frame " gallery next week as part of the collection in my new exhibition and book signing there. She has the same effect every time I see her. I want to paint sunlight again! The Frame: Exhibition of Book Paintings. Rural Study for use of unique exciting washes in a more traditional landscape. 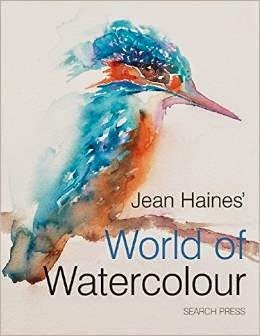 This morning I parted with several paintings from my first book " How to Paint Colour and Light in Watercolour" as they will be part of a new exhibition that opens next week at "The Frame" gallery in Odiham, Hampshire. In the collection of paintings on show will be new work including some favourite subjects as well as a painting similar to the one on the promotion for the gallery opening. My row of Bearded Collies which is a firm favourite with dog lovers and owners. The rose on the dedication page of my book is in the exhibition along with other favourites. The Private Preview is on Thursday 2nd September and starts at 5.30 p.m. I will also be signing copies of my book which will be on sale during the evening. It is going to be very hard letting these paintings go as they all have come to mean so much to me in my first leap into writing but now is the time to part with a few gradually! The rose holds so much love in it that it feels right to allow that one to be the first to part with! See you there if you can make it,everyone is welcome. There will only be places for fifteen people so please could you let me know if you are interested and I will add more details here later. Mia, a Bichon Frise, appearing from a first wash! 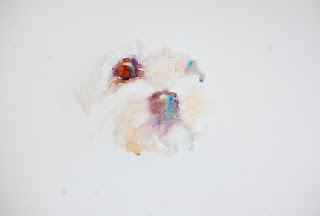 One of the dogs I met during my stay in Norway for my watercolour workshops there was the sweetest little Bichon Frise you ever could see. Her owners had brought her to meet me outside the gallery as I had been painting her from another photograph in the session the night before. I couldn't resist the urge to race and get my own camera to try to take a face shot but Mia was very camera shy and really didn't like "paparrazi" at all. Like a movie star she turned her head away from my lens and efforts to capture her sweet personality. But one shot made those few patient moments so worthwhile apart from the chance to touch such a fabulous dog. The bigger painting of Mia which was part of my workshop demonstration is now looking so exciting I may include it in my next book so it will be shown to my publishers at our next meeting. This meant my heart needed to paint another piece to complete right now. This morning little Mia sat on my desk and begged me to pick my brush up and so I started with her button nose choosing soft shades and then her nearest eye. The reaction I want when people look at my finished painting is one of " Oh how cute" which suits little Mia perfectly. 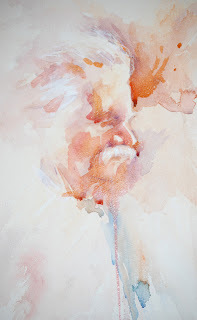 I am painting with emotion attached to each brushstroke as I adore my subject and want so badly to bring her to life .This needs to be more than just a painting or picture. It needs to breathe magically and seem full of life. Like my own dog Mia is elderly so I want to capture a happy moment here , a memory of a very special pet that is so obviously loved dearly. Kjellfrid if you are reading this I hope you like the start of this new painting and I will add the next few brushstrokes as the week progresses. I have an exhibition and workshops here next week so my time is pretty full at the moment so please bear with me! New Collection at The Frame Gallery. 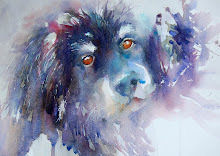 During my watercolour workshops in Norway I had several occasions to paint dogs. 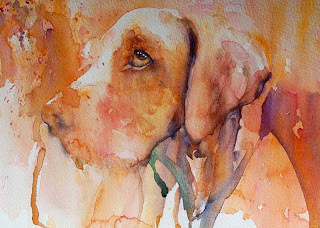 I think hardly anyone at the workshops had read my series on " How to Paint Dogs in a Loose Style" in the SAA ,Society for All Artists, Paint magazine so didn't quite know what to expect. I always start without a preliminary sketch and add colour section by section until a painting is completed. Building up each piece in a combination of layers using transparent and opaque pigment. During the first weeks sessions one artist had a photograph of their small spaniel which I painted as a personal demonstration for them to keep and learn from. 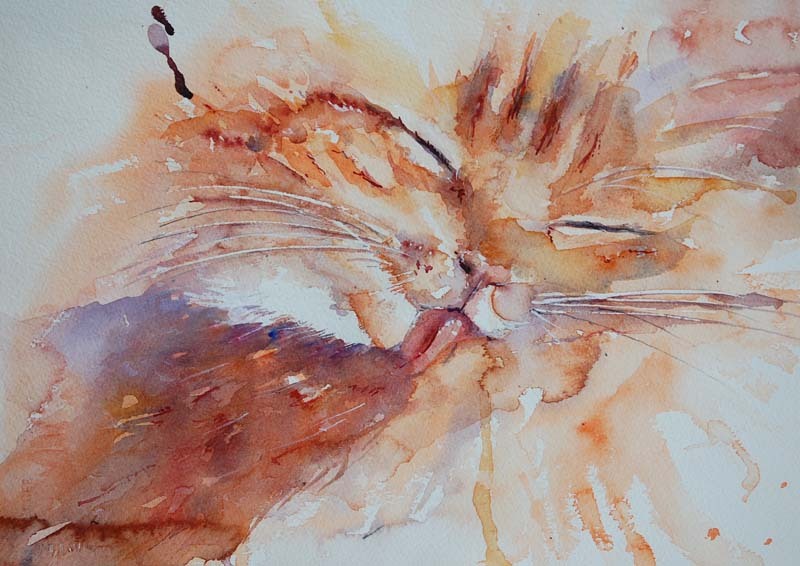 We know as teaching artists that the piece of paper you are working on will often mean far more to the one watching or the owner of an individual pet and for this reason I do often part with studies in classes. But by painting this little dog I was beginning to miss my own far more than I had been already while in Norway. I left UK feeling very worried that I may return to find I had lost Taffy during my trip abroad.His health has been so up and down these last few months and my heart was torn. I didn't want to let anyone down in Norway by not going but my faithful friend of over thirteen years was going to miss me if I disappeared for too long. The morning I left for my flight to Norway I sat and gave Taffy the biggest hug he has probably ever had in his life.Kissing his soft nose and telling him I wouldn't be long was such a hard thing to do. Taffy is not "just" a dog. 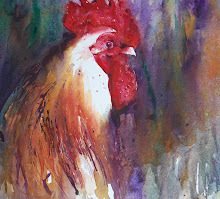 He has lived all over the world with me and been painted by many artists as a willing, comical model. He sits by my side constantly and nudges my arm if I have been painting for far too long. 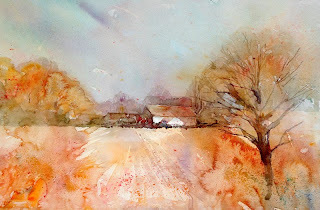 The first weeks watercolour workshop in Norway covered many subjects but I started the second with a demonstration on joining subjects together simply with harmony of colour flowing to each other in still wet sections. I began with one small nose followed by golden whiskers.Beardies rarely have snow white beards from all they eat.. I decsribed to the class how I once mistakenly gave Taffy some spare spaghetti bolognese in his meal. He walked around with stained pink whiskers for ages until I cleaned his beard with whitening toothpaste to remove the reddish colour from his fur. To this day that memory always makes me smile. A red bearded collie dog caused a lot of amusement years ago! This particular demonstration led to a painting five Bearded Collies in a row. Bearded Collie owners will recognise that each dog has their own unique personality. I brought the demonstratioon painting home with me and completed it.This will be shown in a collection of paintings exhibited at The Frame Gallery in Odiham, Hampshire next week along with several paintings from my book. I will add details on a seperate blog entry. A favourite portrait of mine built up simply with placement of colour and no preliminary sketch. Sunday is always a day for quiet reflection. I know I am so blessed in many ways. I have a wonderful family, caring and thoughtful friends. I adore nature and I am surrounded by beautiful scenery. I can travel which takes me to places where I see even more amazing sights and meet even more incredible new friends. I couldn't ask for more. No one could. 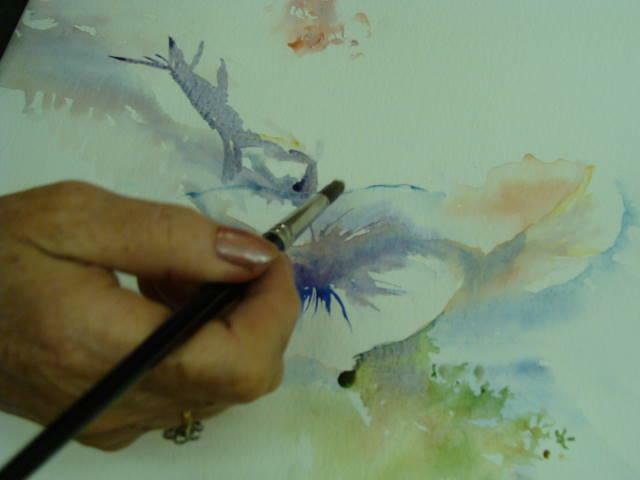 When I pick up my brush each day a feeling of peace flows into each new brushstroke. I feel like a child happily exploring new ideas,teachniques and colour combinations. In my workshops I often ask this question. How many adults get to feel this way consistently gaining a sense of wonder. Whilst working with such a magical medium,watercolour can instill a natural sense of youth in constantly seeing new effects in our results and paintings that thrill and excite us as artists. 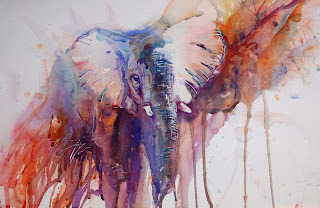 I am totally in love with watercolour and life which is what I try so hard to share in my workshops. A sense of well being and the feeling you can achieve whatever you wish to achieve if you allow yourself to. During my second workshop in Norway I wrote this line on the blackboard.
" The only thing stopping you from achieving anything you want to achieve is you"
I also like this idea although I appreciate it may be harder to do. "No one in this world will feel unloved while I am living in it"
I am a firm believer in walking away from negativity. From those who may have hurt you or upset you. But there is a time to forgive and live your life with peace in your heart.This makes you the better person and the stronger one.Living with heartache or pain can only bring you down to a level where you cannot fly. With the innocence of childhood we fill our lives with joy doing what we wish without worry. As adults we can fill our lives with needless stress. During my recent workshops I was asked how I am always so happy and cheerful. I should be happy as I am doing what I love and choose to do, mixing with positive people who make me feel happy when I see them, always. We can't all have trouble free lives but we can make decisions to make our lives better by surrounding ourselves with only positive energy and people who are good for us.Negativity is like carrying huge heavy rocks on our shoulders. The words "I can't " are a very heavy rock!
" Throw heavy rocks off your shoulders and soar with the eagles"
You will find so many others who are willing to soar with you. From my book " How to Paint Colour and Light in Watercolour "
Having returned from my trip to Norway I just realized my next time away will be in South Africa so I will have the opportunity to gather even more wonderful images there. 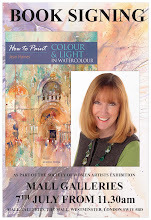 My visit will be in November 2010 following book signings,workshops and exhibitions in U.K. I know this will see a change in direction of subjects and it will also follow my fully booked "Africa" workshop which takes place in October of this year. My life is so rich,full of so many fabulous moments and people. No wonder my art is always happy and exciting for me to work on because I never have the chance to feel bored! No watercolour workshop of mine really seems complete without a cockerel in it. Somehow they seem to decide to jump straight into a demonstration as if they have a right to be there. 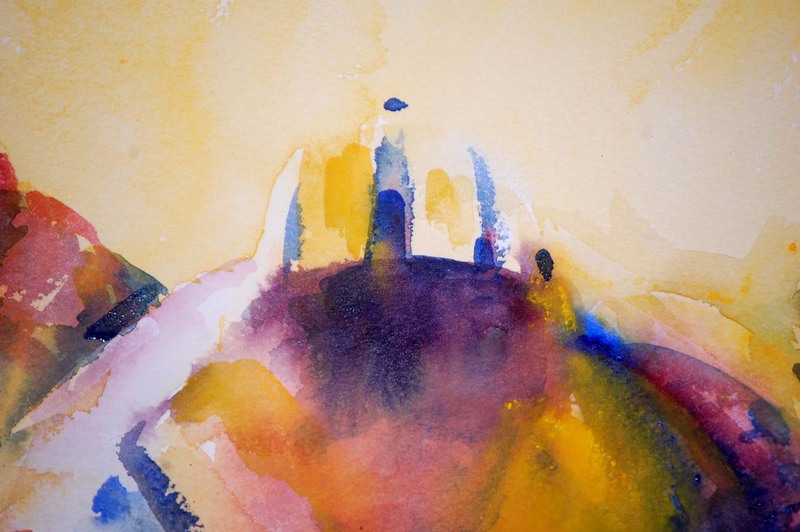 I ran two watercolour workshops in Norway for two completely different groups of artists. During the first workshop I gave a demonstration on how I build up a painting from a simple starting point. 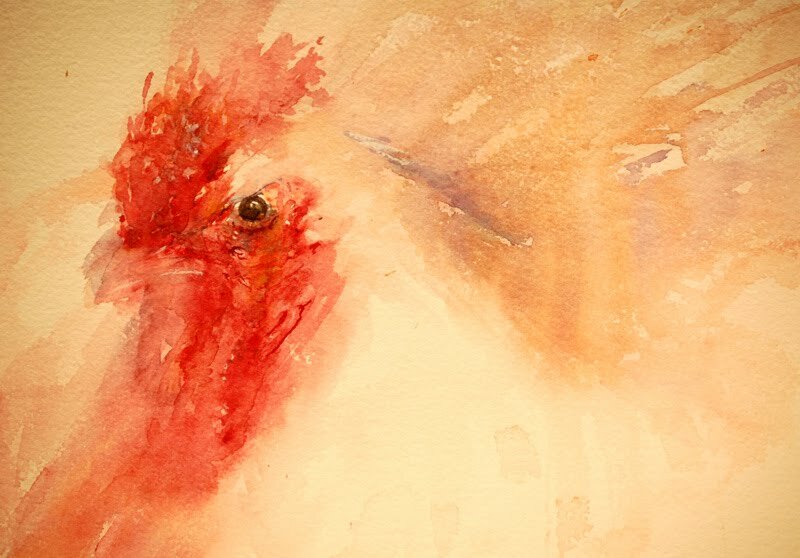 With the cockerel above it was the eye although with many it may be the comb or wattle,the brighter red sections which are more powerful in the composition. 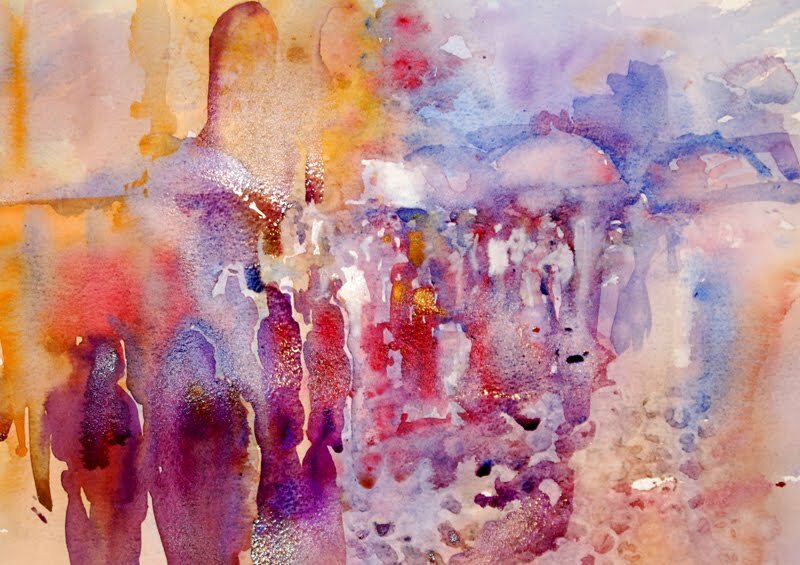 For many teaching artists walking into a different room with a sea of new faces watching your every brushstroke eagerly expecting great results and gorgeous paintings can be a nerve wracking experience. For me it is one of sheer joy to be able to share my passion for art, my favourite medium and my technique. Each demonstration is completely different as my results are always unique. So I get excited by them too! 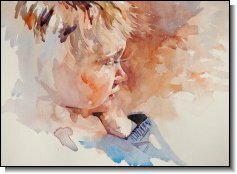 In Norway I was faced with a new situation in that many artists attending my class were used to being given the subject and full preliminary sketch which they can use to add colour in step by step stages in order to build up a complete painting. This means that at the end of each session everyone can take home a similar result as the composition is already planned and worked out by the tutor before the workshop begins.This is a very popular and succesful way of teaching which has been followed by masters over the centuries. So if you were unaware of how I work imagine the shock of coming to one of my workshops where pencils and preliminary sketches do not exist. The teaching style difference is so very great in that each student attending has to depend totally on their own instincts, own creative input and own emotions regarding choices of colour and where to place it. With each new group I explained my technique and reasons for working this way. I thrive on magical colour combinations and the power of this incredible medium. And so we started with simple exercises aimed at showing how placing the pencil to one side can lead to magical results that are unique and full of life. It was fantastic to hear the excited comments from those who were thirsty for something new, different and achievable. I felt as though at times I was being drawn into the atmosphere as question after question was raised on how my subjects emerge from simple placement of brushtrokes and colour on a white sheet of paper. I felt exhilarated by such incredible enthusiasm for more and more subjects to be covered and worked on in the sessions and I met such amazing people in the process of simply sharing my style. 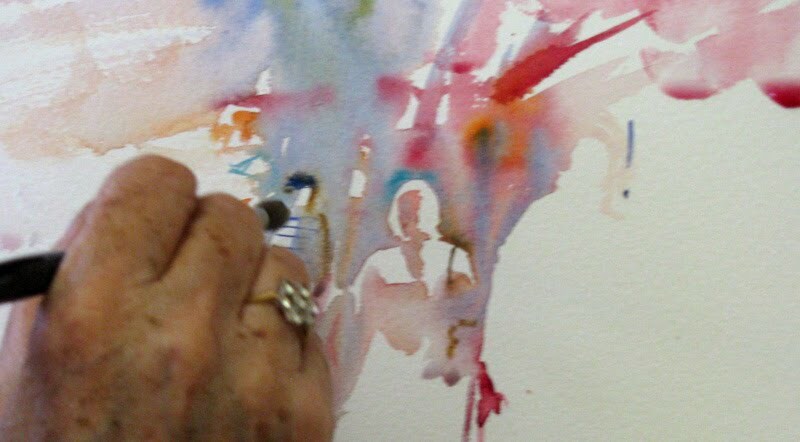 I love my way of working in watercolour and my enthusiasm is always evident every time I am teaching. But I am aware it is hard to jump from one style you are used to in a workshop when the demonstrating artists techniques are so far apart from what you already know. Which makes the thrill even greater when ideas start to click on why a technique works and this is so fabulous to experience. Leaping into the unknown and loving it is part of my daily routine. I don't have set lines in a preliminary sketch to guide me so each journey takes me into the unexpected with often magical outcomes. To take others with me on this journey is such a fantastic feeling especially when teaching you turn around in a class and see such fabulous reactions to each new individual result. 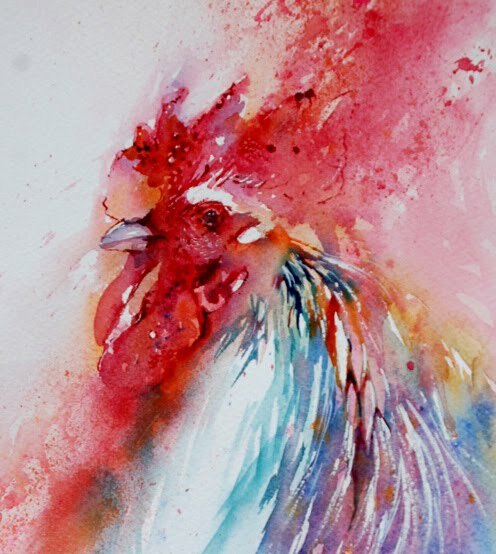 I also use colour for healing and therapy.So painting in vibrant red when I had flown to get to the location, stayed in a room that was new to me and needed extra energy was a wise decision. Choosing red for this cockerel not only acted as a demonstration to the class but also gave me a sense of well being to help add and rise to new levels in my demonstrations that followed. I have so much to share and as I need to catch up in my studio I will gradually add magical moments here over the next few weeks. But I have to say I was completely taken aback by such a warm and eager reception and now I feel even more enthusiastic to give even more. 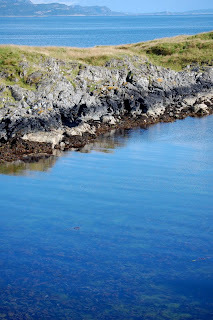 Roll on my next workshops which take place in August and September here. I am so alive and eager to share my new sense of colour and subjects from Norway, They are going to be amazing! This "Celtic Angel" as I have been nicknamed is about to start painting for the first time since I arrived home. I have only just returned from my watercolour workshops in Norway which took place over the last two weeks. Having so much to share and so many amazing images I realize the time it will take me to add to my blog will be great so I am going to add my experience gradually because it is such a magical place. From the minute I arrived to the sad moment I left I was surrounded by the most spectactular beauty of both nature and warmth from the wonderful Norwegians I met during my visit. It all seems very much like a beautiful dream this morning because every single day was fantastic. So much so that the possibility of further workshops is already being discussed for 2011 for those who couldn't get there with me this year. If you are interested please book early as places disappear so very quickly and I just can't do justice to this gorgeous location by words alone. Here the atmosphere of magic, inspiration, motivation ,even healing hits you constantly. I have felt alive, refreshed and so eager to keep my brush moving whilst I had the opportunity to capture so many fresh and vivid colours. New exciting subjects faced me constantly. I also have been touched by the kindness,enthusiasm, warmth and genuine interest in my technique by so many of the artists I met whilst I was there. I am going back and there will be a chance for just a few lucky enough to book a place to attend my next workshops there and enjoy the experience of a lifetime with me yet again. For now I want to quietly absorb so much that has enriched my life over the last few days.Days filled with many happy memories which will stay with me for the rest of my life. Often when we go away as much as we love where we are staying we still look forward to coming home. Just for once I can honestly say leaving made me feel very sad. I loved Norway that much. 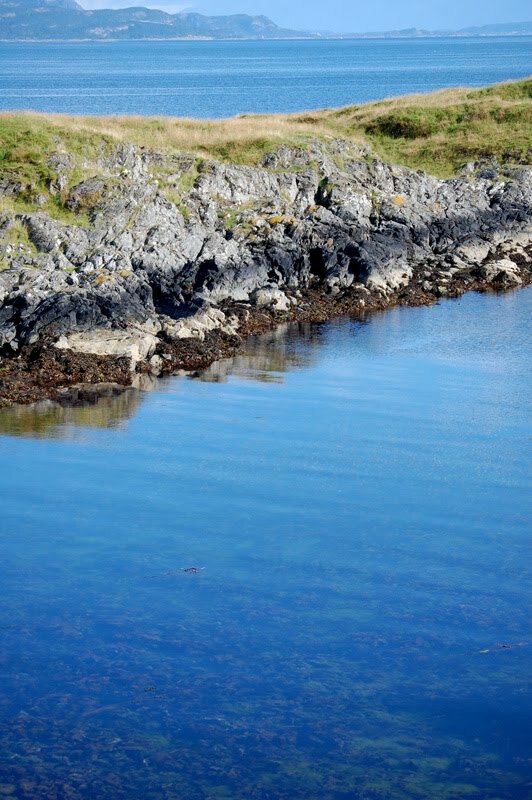 Colour of Norway, a clear blue sea of a colour that is so filled with magic for an artists soul. Thank you so much to everyone in Norway who made me feel welcome, wanted and generously gave me a welcome into their hearts and art. I truly am in love with both Norway and everyone in it. All my bags are packed. I'm ready to go! Including a few extra books as the number of artists on the workshops in Norway has grown since my publisher kindly sent the original order over in preparation for my trip which starst tomorrow. I can't wait to meet everyone . I leave at five in the morning and am looking forward to a boat trip after my flight from UK to the island where I will be demonstrating. I have heard so many wonderful suggestions this week about where I am heading including the possibility of seeing the Northern Lights which would be yet another dream come true if this happened. I am going to meet some very wonderful artists there so I just know this will be a brilliant opportunity and yes, I have received lots of emails from artists who couldn't make it this year and will reply soon, promise! I hate leaving my two dogs as my elderly Bearded Collie has been really poorly over the last few weeks but has now happily stabilised to the point where I feel safe to go. Today saw me grooming the pair of them under a tree in the shade which was a wonderful way to take time out from packing. I have been unable to reply personally to many emails or messages but hope to catch up on my return. As two exciting exhibitions are in the midst of discussion with amazing artists I really needed to devote some time to those and book signings which will take place in several locations. My diary is really exciting for this Autumn! Have a fantastic few weeks without me and God Bless! 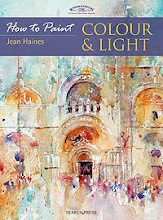 "How to Paint Colour and Light"
5.30 p.m - 7.0. p.m.
My next book signing will take place at " The Frame" gallery in Odiham, Hampshire on 2nd September 2010 at 5.30 p.m. 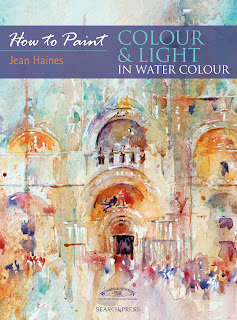 There will be a new collection of watercolours on view at the gallery as well as cards and originals from my book "How to Paint Colour and Light in Watercolour". This will take place in the form of a celebration of my becoming an author for the first time so if you would like a copy or have one you would like me to sign please come along to this brilliant new gallery and meet Jan the owner as well as myself. "The Frame" is a terrific new gallery that boasts original work by Paul Banning RI and many other fantastic artists. My collection there has dwindled over the last few months due to its popularity but some exciting new paintings are about to be on show so please pay a visit if you are in the area. "How to Paint Colour and Light in Watercolour" is available on Amazon.com. 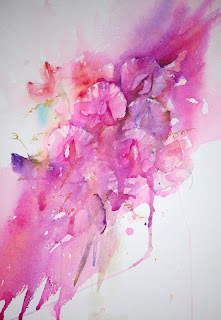 The bouquet of Sweet Pea is still on my studio desk so several paintings of them have now emerged. I have been preparing for my watercolour workshops in Norway but each time I walked into my studio the scent from these pretty flowers distracted me. So much so I just had to capture them continually in watercolour. Their forms are fascinating.With ruffled skirts acting as a backdrop to a delicious central shape in the foreground they give an artist all they need in a composition. 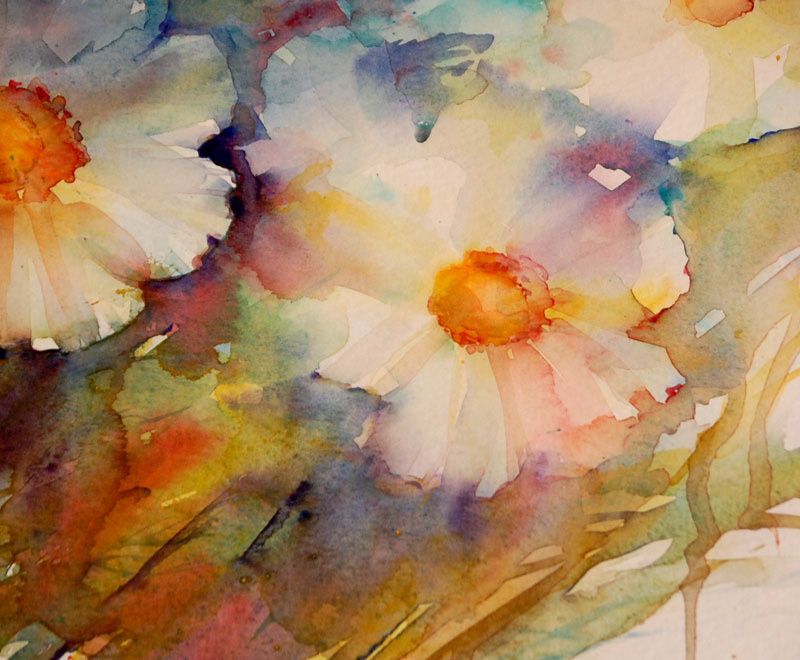 The petals seem almost transparent which makes them perfect as a watercolour subject. Colours just running merging to create individual blossoms has been heaven while I have been so hectic with plans for 2011,this Autumns workshops, exhibitions and projects. And of course my trip to Norway. I am aware I juggle so much and enjoy the challenges but at times when I need quiet I find solace and calm simply just by sitting surrounded by nature which soothes the busy soul and brings me to a place of peace that flows into my watercolours. I have several friends who are facing such trauma in their lives at the moment and my heart reaches out to to them. Because it is Sunday I am adding a lovely quote from Anne Frank in case anyone needs to hear these words. So true. If like me you have gorgeous flowers in your garden I suggest capturing them while you can painting from life. Because Summer as a season seems so short as does the lifespan of beautiful blooms. Many of my friends know I have had the most worrying time with my elderly dog Taffy .Sitting with him in the garden or working with painting flowers from my garden has brought such comfort to me at times when I have felt the saddest. Taffy is still here and stable now over the worst and happily lazing in the garden as I type! Yesterday I continued to work on my new collection for an exhibition which uncludes horseracing scenes, landscapes, cockerels and so many favourites. I was completely engrossed in my work when a friend called around unexpectedly with beautiful bouquet of sweet peas. I had mentioned these have always been a favourite flower of mine and I was thrilled. Immediately after they left I intended to go back to work in my studio on a large painting which was coming along so well but the heady perfume of the sweet peas kept calling to me. I couldn't help but follow my instinct. 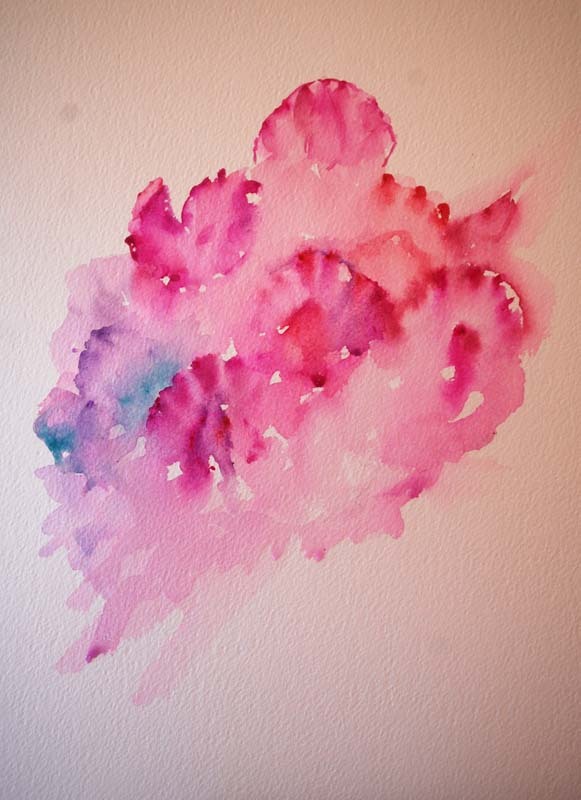 Using a fresh piece of paper I studied the vibrant shades of the individual flowers. I opted for Sennelier "Tyrian Rose" as my main shade and began with a single blossom moving away to create others in the surrounding sections. 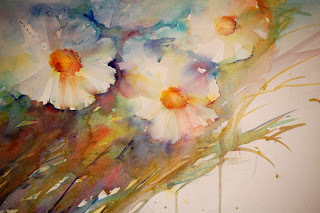 One mauve head stood out in the background of the posy which when painted created an illusion of distant petals. While I worked I thought of the many occasions my Grandfather would pick beautiful bouquets of sweet pea from his garden on a Sunday. I was allowed to carry the bunches in my tiny hands and their perfume now thrills me as much as it did then. He had rows and rows of amazing flowers in his garden all merging with each other and creating gorgeous patterns in sunlight. I was never allowed to pick them but admiring their beauty even at that early age inspired my way of working today. How impressionable we are as children and how incredible that memories of our past can flood into our present in so many ways. With mine it is always connected with colour. Favourite Jockey section from a very large painting. What a week again. I have been really busy working on a new collection for an exhibition, having meetings and discussions for new projects that are really exciting. I find myself replying to many emails requesting spaces on workshops and wishing to book demonstrations. In the last twelve months my art career has changed beyond all recognition and my first book is only just hitting the market. Attention from being a new author may have a lot to do with how things are moving in my life right now as well as being in terrific galleries. I am aware my art has evolved and is constantly evolving to a new exciting level which means the thrill I feel when I pick up my brush is even more intense. I know when I hold workshops I always try to find new techniques and approaches so that anyone returning will have the joy of seeing something completely different. I also know when I wrote my first book I shared how I worked at that time in my life. But each technique I have shared I have now expanded on with new wonderful methods always hitting me on how to make a painting look even more alive and as if it is moving. I am hoping to share these in book two in a style of writing that will be easy to follow especially if readers have followed my ideas in book one. To create any book with well over a hundred images an artist needs to paint constantly which I do. In my first book I wanted to include so many paintings that helped lead the reader into how each piece was created demonstrating my washes and brushwork. But as a professional artist I also paint for exhibitions and galleries. Surprisingly with the demand growing for my work I find instead of creating more paintings I am actually creating less but each is completed to a standard that means when it leaves my studio I am sad to see it go. I will never fall into the category of "churning out work" simply for sales. That would kill my creative spirit completely. From experience I believe this is my biggest selling factor.The fact that work is not there readily on demand proves I paint what I love when I want to. Each piece is one that has been enjoyed while the paint was still wet with each new brushstroke meaning something to both myself as artist and the finished piece. This is part of who I am and will never change. 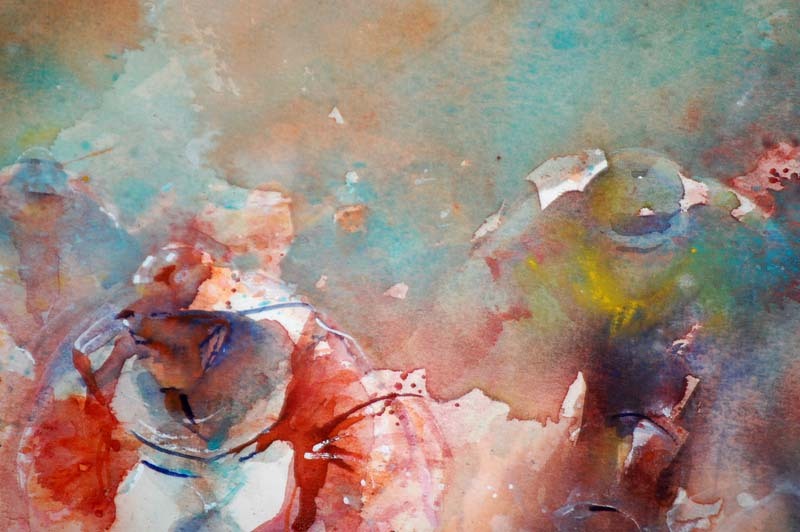 My favourite jockey above was in a large painting last week which sold the day it left my studio. As soon as it was seen. Will this see me painting more like this? Absolutely not because this week has seen me painting flowers from my garden. Thi si swhere my heart led me. My brushstrokes shone in the sunshine and these will carry a huge impact into my next collection. Having said that I have some gorgeous cockerels and new racing scenes just begging to be finished! I wish I had forty eight hour days and no need for sleep at times because mostly I just want to paint in my studio and explore so many ideas that are taunting my imagination right now. I often feel I am racing. Racing to capture so much before the image leaves my mind or play of light before it has faded. I want to capture all the summer flowers before the summer has passed. Isn't that such a precious commodity. Time to learn, time to grow and time to evolve. Each season I choose card designs to take with me to demonstrations and workshops. 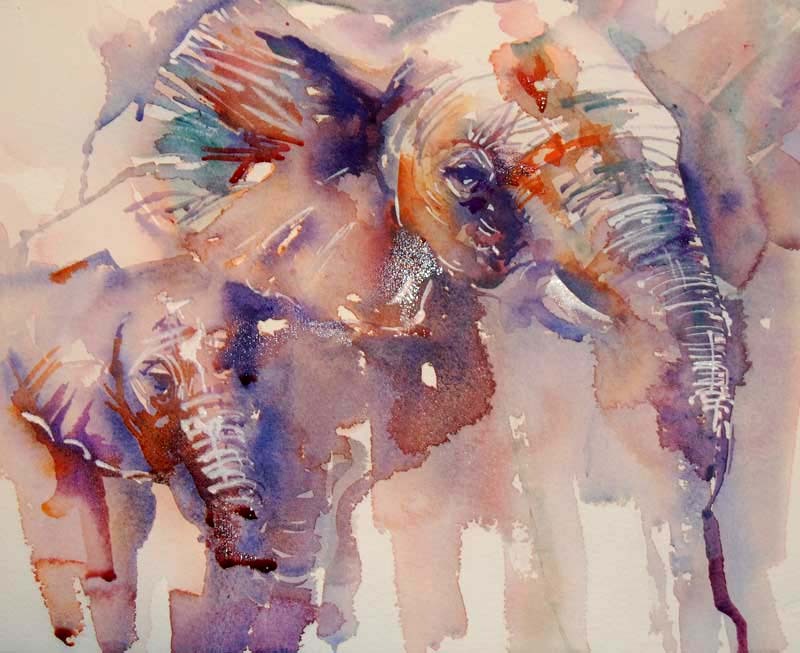 I try to select a variety to show the many subjects I cover in my watercolours and always lean towards favourites.Paintings that hold a story or meaning with an emotional attachment. My cards have been selling out very quickly so I wasn't surprised to find I had absolutely none to fall back on at the start of this Autumn season. On top of this I am being asked for more by galleries. The selection I had on display at the SWA Society for Women Artists sold out in no time so I knew it was time for an order. This arrived yesterday and I am thrilled with the new cards which will be available from August 31st. Here are my new cards and I hope you like them. From the cover of my book which seemed a wonderful way to celebrate its launch at the Mall Galleries. Again from my book " How to Paint Colour and Light in Watercolour"
The owner of this gorgeous dog is delighted he is now available on a card. and owns the original painting. Without a cockerel in my new collection I doubt anyone would talk to me! I love this one which was sold at an auction for the Lady Taverners raising funds for very special children. It seems strange to sell Spring Flowers in Autumn but they jsut seemed right for this new collection. And I don't normally do this but I have had so many requests for " Too Wise" which has sold out in every single workshop and gallery that it will be available once more this fall. Building up Colour and adding definition. 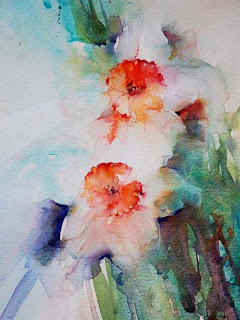 I have many paintings of flowers from my garden this Summer. Nothing can compare to painting from life in sunshine. These are the moments I take time to to record colour as it really is so I can work from life long after the flowers have passed during the seasons as they change. Photographs can only give you an image to work from but they cannot give you the full 3D effect or the glorious sensation of sunshine hitting white petals and creating colourful shadows as they do in real life. I have thoroughly enjoyed a mass of white Cosmos in a flower bed for some time now. Absorbing the many terrific joys of the flowers merging with each other and moving in the gentle summer breezes. 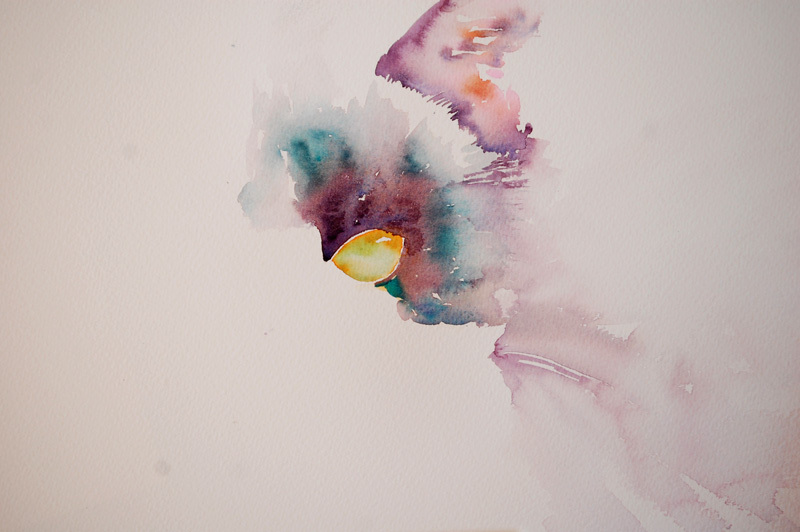 Here the composition is gradually growing and building up in both colour and detail. After working in my garden on the first and second washes I later brought some flowers into my studio to paint their shapes in more detail. Placing them directly next to my initial painting gives me a clear impression of how close I am to their form and even their feeling of being light and airy. 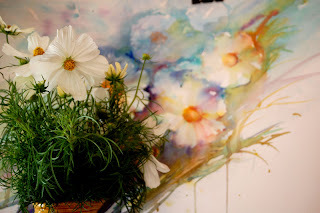 The real flowers next to my painting on my easel. I paint from life as much as possible for vibrant colour and effects. This way I can consistently gain new ideas for colour combinations and texture techniques. I have yet to capture the hollyhocks before they disappear! 3) Study their shapes. Think about what makes them interesting and imagine how you can capture that in your work. 4) Stand your painting next to the real flowers and let them tell you what is right and what is wrong about your results. Believe it or not they will! 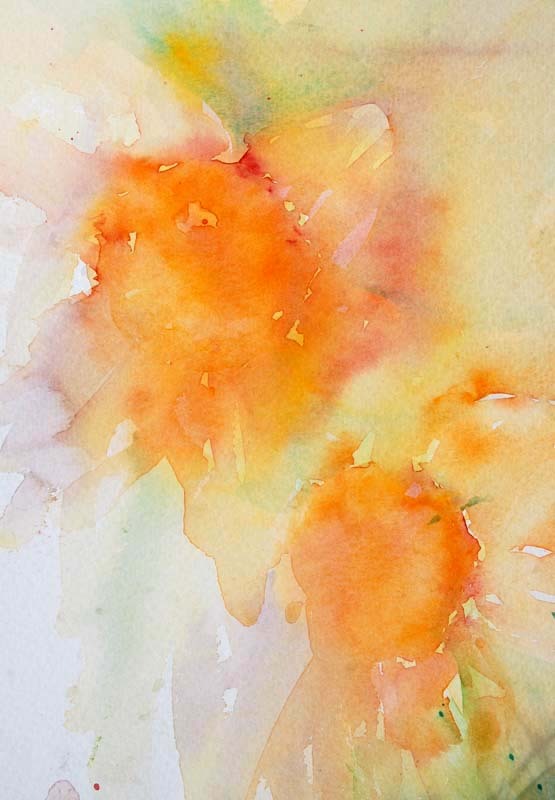 Daffodil Wash from my first book " How to Paint Colour and Light in Watercolour"
Colour merging and mixing on paper, sections left white and hardly any detail yet. 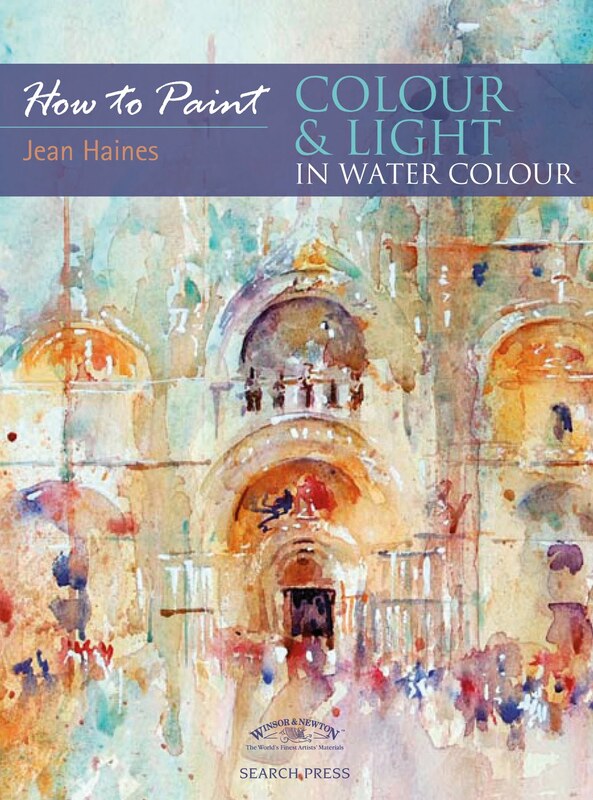 I am looking through the stages and washes of paintings from my first book " How to Paint Colour and Light in Watercolour". I have one study of daffodils which I added in a chapter purely to demonstrate how colour alone can simply hint at a subject with very little detail. Looking at the above image at first you may not see the daffodil centres. You may not see the hints of petals appearing around these circular forms. But while studying the placement of colour the flowers do seem to be there.A lot of information is already given without us even realsing it. Just a few touches now could turn this into something really alive and uniquely special. The imagination of the viewer of of every individual artist leads them to their own preference of style. There will be those who want far more detail and those who enjoy a wash just as it is. This piece is far from finished and it is going to be sheer joy to complete now that I have all the original paintings from my book back with me from the publishers. I have learned so many lessons from my first leap into being an author. 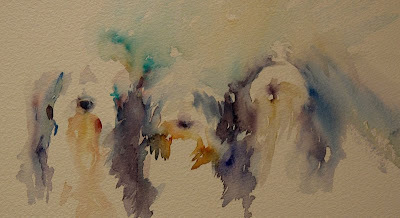 Now while writing again I have come to understand the hardest part of writing a book on art with demonstrations is actually leaving a number paintings unfinished. The temptation to complete them is so strong. It is so hard to leave an exciting work in progress. to share the stages and development of technique. I am sure all artists will understand that heady feeling of the moment when everything is going absolutely right in a special painting.. The colour will be perfect,the shapes will form and you just know you have a winner on your hands. I did with the above daffodil painting. I just knew a few more brushstrokes and I would have something terrific that I would love. But to add those brushstrokes meant I couldn't share how I start a painting and it also meant adding yet another finished painting to the book which would have no value for anyone wishing to follow my style. Any book with the title " How to " has to include ideas exactly on that theme. How to do whatever the book suggests in the title. As much as I would have loved to sharing many complete paintings would have been pointless and there was only so much space. 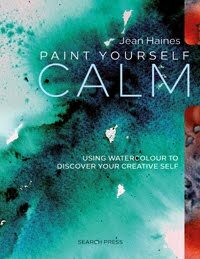 This book was not about me or what I can achieve with watercolour. It was and is about guiding the reader into trying to paint colour and light in a loose style in a way that is fun and attainable. Writing has taught me self discipline. It has taught me paintings in a book are not just about the artist as an author or how talented they are. It's about giving on so many levels. Giving ideas to others so that they too can share a passion. About sharing your technique and experience selflessly. To have a book full of complete paintings may show the reader what an artist can do but it won't help show how they actually work. And so this morning I am sat quietly in my studio with a wonderfully half finished painting and I just know it makes my point so well for one particular chapter in my next book. Just a few more brushstrokes and it will be complete and could go to a gallery. But right now it easily leads the eye into why I have chosen certain colours and defined sections against others that contrast. In my heart I know I need to leave it and share it as it is but it is so hard when the artist inside you is screaming for you to finish the painting and forget the book. I'm going to try to leave it, my next book and chapter wins!